Well, it is not as if I relish rubbing salt into old wounds, but this quote from the latest piece by Ben Hall in Paris and Ralph Atkins in today's Financial Times is just too good to resist. French manufacturing output rose at its fastest rate for nine years, according to a survey on Monday, confirming that France has become the economic powerhouse of continental Europe. Purchasing managers’ indices for manufacturing showed France performing significantly better than the continent’s other main economies – thanks to robust domestic demand. ii) France's more favourable demography means that the French government has more space for fiscal stimulus (when compared with Germany) which means the "cash for clunkers" can roll on a bit longer. The current recovery could be conceptualised as a group of Tour de France cyclists set on scaling the slopes of the notorious Tourmalet. One group of riders - mainly emerging economies like China (current PMI 55.4), Brazil (53.7), India (54.5) and Turkey (52.8) are out in front, with just two developed economies having "escaped" from the main group to try and catch them, France (55.6) and Sweden (56.7). Then comes the main group, who continue to show a modest recovery, howevering around or even (at last) somewhat over the 50 point break even mark (Germany (51), the US (55.7), Japan (54.3), the UK (53.7), the Netherlands (50.5), Austria (51.1), etc). In Eastern Europe, the Czech Republic (49.8) and Poland (48.8) though still weak continue to gain ground, while the Russian team this month unexpectedly had a puncture, and dropped back into contraction territory (49.6), after registering growth in September. And then come the stragglers lead by Italy (which is peddaling furiously, but - with a PMI of 49.2 - doesn't seem to ever quite make it over that critical 50 mark, oh well, next month perhaps),followed closely by Hungary (48.2), Greece (48), Ireland (48), South Africa (47.8) and of course, in last place, I think the rider is now so weary he is getting off to walk the bike up the hill, comes poor old Spain (46.3), where more or less predictably, the contraction continues. In particular Spain stands out as almost the worst case scenarion now, with a manufacturing sector which continues to bleed jobs in a country where no one seems to have any serious proposals about what to do except wait in the hope that things might get better eventually, and of their own accord. The sky in front with always be clearer mañana, of course. “Italian manufacturers reported that their recession which has spanned eighteen months finally ended in October, two months behind the Eurozone as a whole. Production rose for the first time since March 2008, driven by a marginal return to growth of new orders. Although the October survey represents a step in the right direction on the road to recovery, weakness persists which suggest that a sustainable upturn is by no means guaranteed." 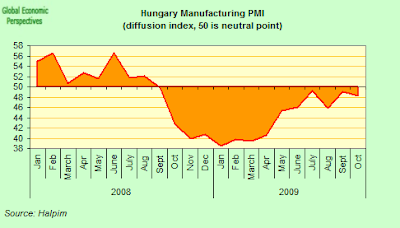 Hungary's manufacturing purchasing manager index dropped 0.8 percentage points to 48.2 points in October, according to the Hungarian Association of Logistics, Purchasing and Inventory Management (HALPIM). The October reading suggest the steady improvement that started in the spring may now have come to a halt. The seasonally adjusted Markit Greece Purchasing Managers’ Index fell marginally to 48.0 in October from 48.5 in the previous month. 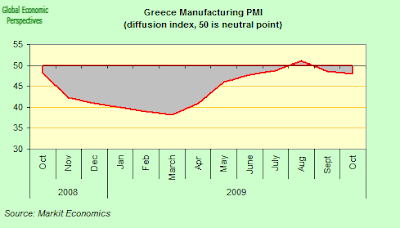 The latest reading signalled another slight deterioration in operating conditions across Greece’s manufacturing economy. In Ireland the October data indicated that, while operating conditions at Irish manufacturers continued to deteriorate during the month, the sector moved a step closer to recovery. Both output and new orders fell only slightly, and purchasing activity decreased at a markedly slower rate. 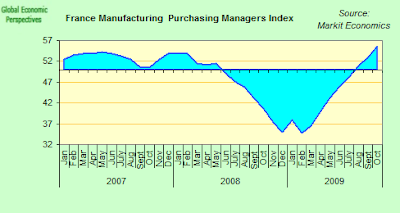 The seasonally adjusted NCB Purchasing Managers’ Index rose to 48.0 in October, from 46.6 in the previous month. 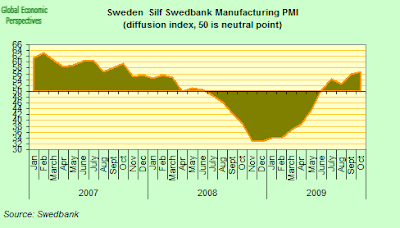 This signalled that the rate of deterioration in business conditions eased to the weakest since February 2008. South Africa’s purchasing managers’ index rose to its highest level in 16 months in October as the country’s first recession in 17 years eased, according to the monthly report from Kagiso Securities. The seasonally adjusted index increased to 47.6 from a revised 45.9 the month before. 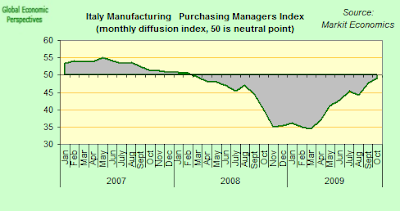 The index has been below 50, which points to a contraction in output, since May 2008. 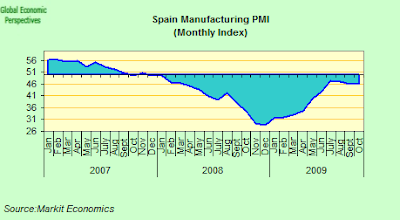 Operating conditions in the Spanish manufacturing sector continued to deteriorate in October. Output fell further over the month, while new orders contracted at the sharpest pace since May. Supplier lead-times lengthened for the first time in nineteen months. The seasonally adjusted Markit Purchasing Managers’ Indexcontinued to signal a marked decline in overall business conditions, posting 46.3 in October. Operating conditions have worsened in each month since December 2007. Output decreased modestly in October as the wider recession in Spain continued to impact negatively on demand. Production has now contracted in twenty of the past twenty-one months. 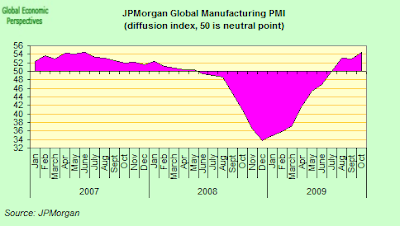 So, as JPMorgan say in their Global Manufacturing report, the Global Manufacturing PMI hit a 39-month high in October, and at 54.4 posted its highest reading since July 2006. 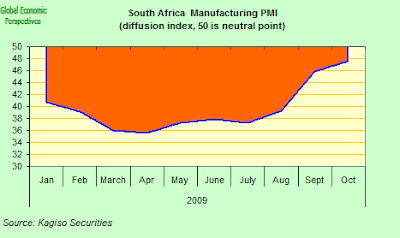 The PMI has now remained above the neutral 50.0 mark for four successive months. 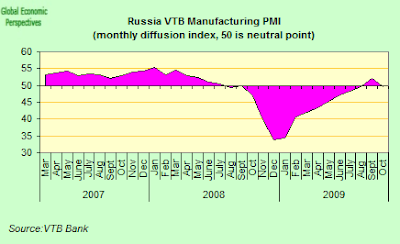 But while the general picture is one of solid, if modest, growth, the group of stragglers at the back of the pack (to which would could add names like Latvia, Portugal, Romania, Finland, and Ukraine, where PMI surveys do not currently exist) point to potential problems further on down the line in 2010. Also of concern is the way the index in export dependent countries like Germany and Japan (both suffering the added impact of having a high currency following the ongoing dollar weakness) continue to struggle for air. This is more apparent in the German than the Japanese case at this point, but the survey organisers specifically highlightend the way in which survey respondents in Japan are already reporting a lack of "bounce" in export orders, and this once more serves to highlight the weak spot in the current recovery picture - where are all the customers for all those exports eventually going to come from. This final point, along with the negative impact that problems among the "stragglers" may present for the main group later on up the hill suggests, to me at least, that while many emerging markets remain strong, we will almost certainly not see anything resembling a "V" shaped global recovery, and especially not in the OECD countries. As far as I am concerned this hypothesis can already be safely discarded.